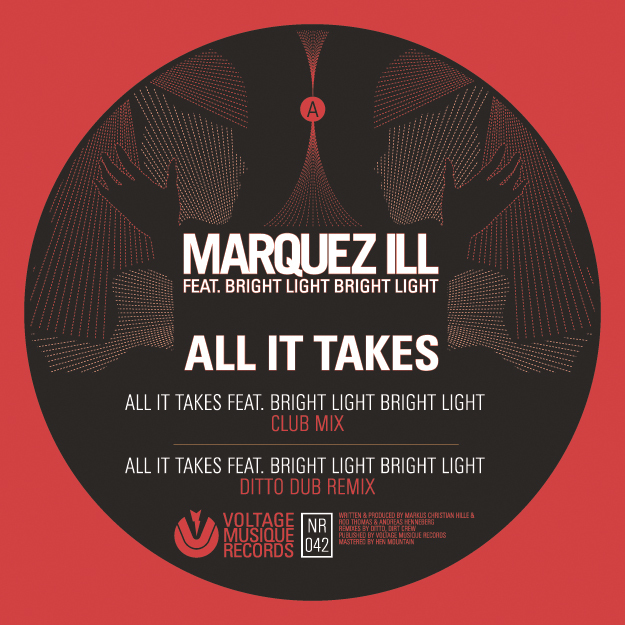 „All It Takes“ is the long-awaited third single from Marquez Ill on Voltage Musique. Definitely worth waiting for, „All It Takes“ features vocals by Bright Light Bright Light – one of London’s up and coming talents. With a pinch of House music and a dash of pop attitude „All It Takes“ gives some much-needed soul to club music. Marquez Ill is supported by a rework from house legends Dirt Crew as well as refreshing remixes from New Zealand’s Ditto. Played by AKA AKA, Alexi Delano, Andreas Henneberg, Azari & Ill, Beatamines, Danilo Vigorito, Dirt Crew, Dubfire, Fabian Reichelt, Franco Bianco, Gel Abril, Glanz and Ledwa, Greg Delon, Gunnar Stiller, Haito, Homebase, Jamie Jones, Jesse Rose, Joy Kitikonti, Josh Wink, Klangware, Kolombo, Lars Wickinger, Lula Circus, Maceo Plex, Marcus Meinhardt, Michel de Hey, Mihalis Safras, Nudisco, Paco Osuna, Paso, Pierre Deutschmann, Pizeta, Roberto Rodriguez , Ron Flatter, Satoshi Fumi, Siopis, Steve Bug, The Glitz, Tim Green, UGLH!